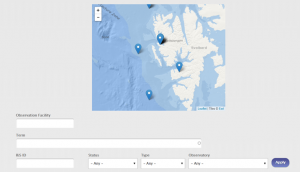 The SIOS Access Programme facilitates access to the full breadth of research infrastructure on Svalbard that has been made available to SIOS by its members. The programme is coordinated by the SIOS Knowledge Centre (SIOS-KC) in collaboration with the Research Infrastructure Coordination Committee (RICC). The distributed infrastructure, known as SIOS RI, is owned and operated by SIOS members. SIOS offers access opportunities to these scientific facilities and research instruments through regular strategic SIOS calls. The first pilot access call was conducted in 2017 with field work taking place in 2018 (see Access projects 2018). Subsequent calls for access will be linked to the research priorities identified in the SESS report. The calls are organised by SIOS-KC, utilising SIOS committees and external reviewers to facilitate an effective and transparent project review and assessment process. Access to SIOS RI is in accordance with the SIOS Access Policy. 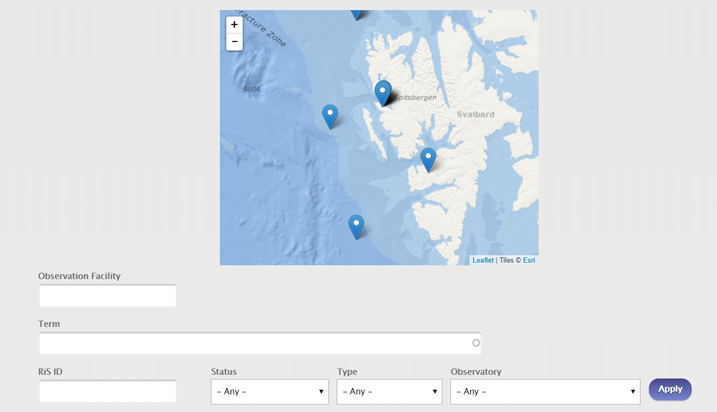 SIOS has developed a catalogue which provides an overview of the observation facilities which collect SIOS data. An observation facility can be one instrument or a collection of instruments, e.g. a weather station, and is a term used by the World Meteorological Organization (WMO). The annotation is standardised following the WMO standards as far as possible, in order to make entries unambiguous and interoperable internationally. The purpose of the catalogue is to make better use of the existing research infrastructure by facilitating the search for given parameters and their location. In this way, duplication can be avoided and new measurements can be co-located with existing ones. The catalogue may also be used to gain a simple overview of collected parameters and how to access the data. The search interface allows users to search for GCMD keywords or to filter by status, type or observatory. The map interface may be used to search in a particular area. The catalogue was developed by the Norwegian Meteorological Institute, with input from a task force consisting of representatives from the Norwegian Polar Institute and the Alfred Wegener Institute. NySMAC members and RICC gave valuable input on the test version. Click here to view the catalogue. To enter data, you must be logged in with the assigned role "RI responsible". Please contact Inger to have this role assigned to your account. For general information about research infrastructure in and around Svalbard, please visit the web portal of Svalbard Science Forum.